I traced the outline of my camera on the leather scraps, making sure to leave some room around the edges to take in consideration the thickness of the camera. 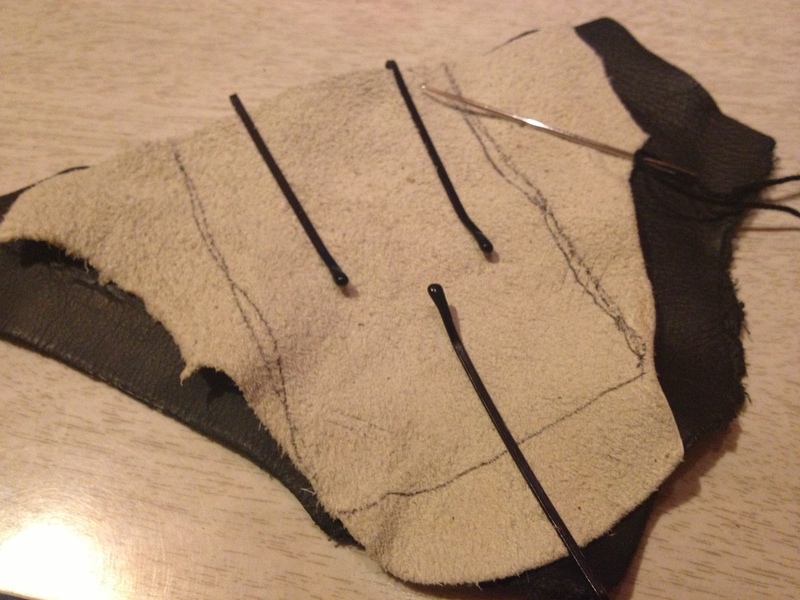 The leather scraps are placed so that the faces that are touching will become the exterior of the case and what is being traced on is the interior. 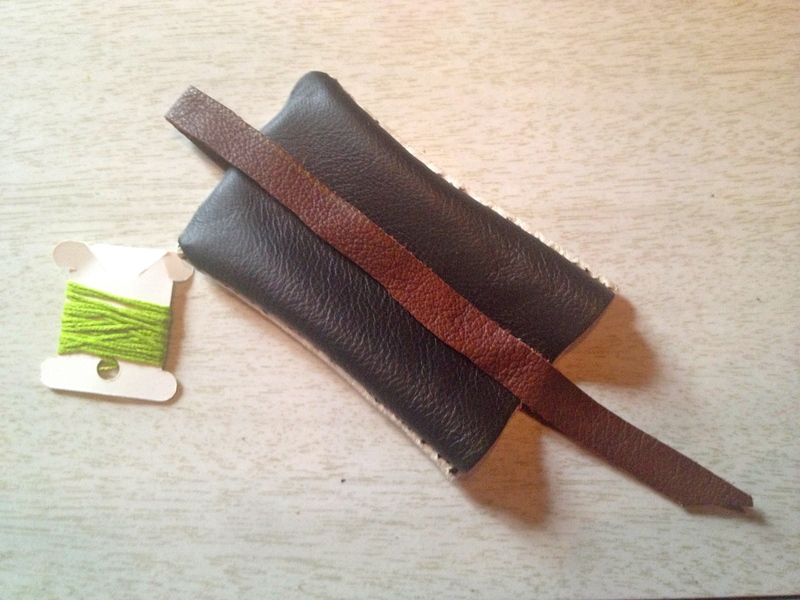 Since the leather is pretty hefty, I used large bobby pins to hold it in place while I stitched the two pieces together. 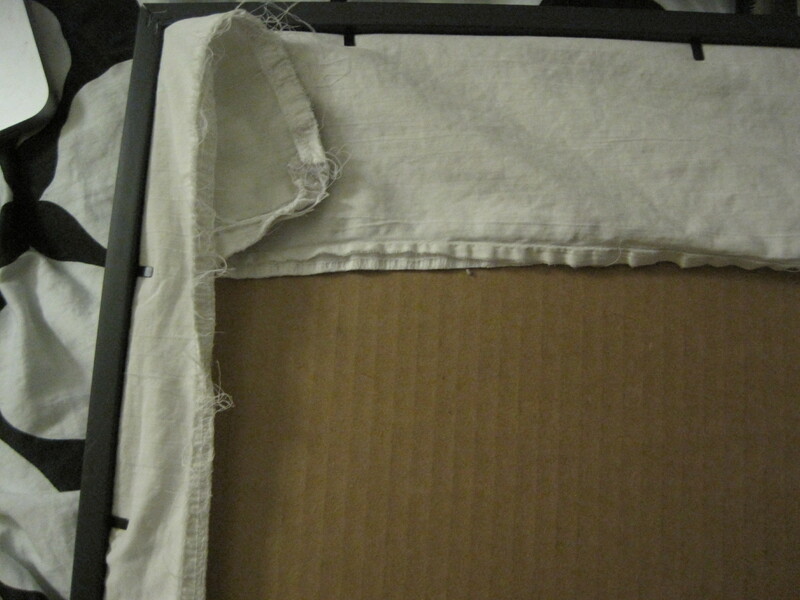 I then used the embroidery floss to do a not-so-professional looking stitch around my template. 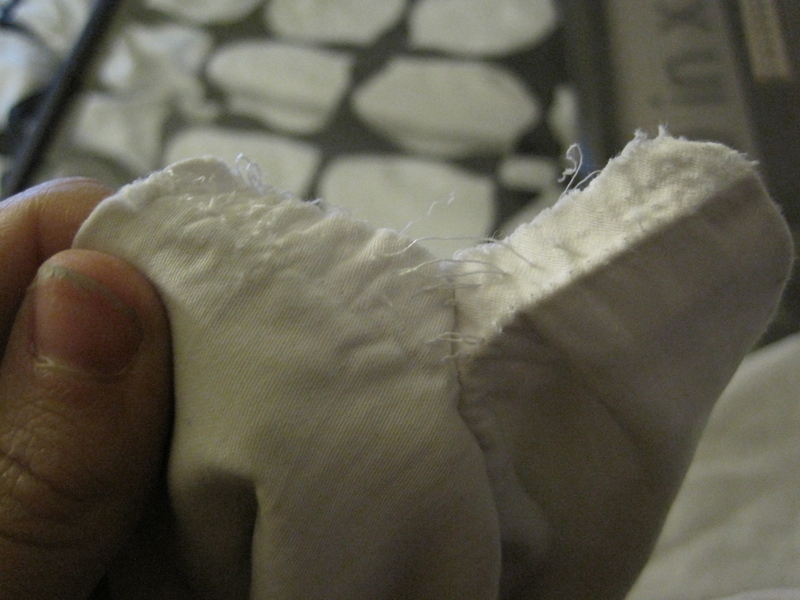 Then I just trimmed the edges down to a little less than a quarter of an inch from the stitching. 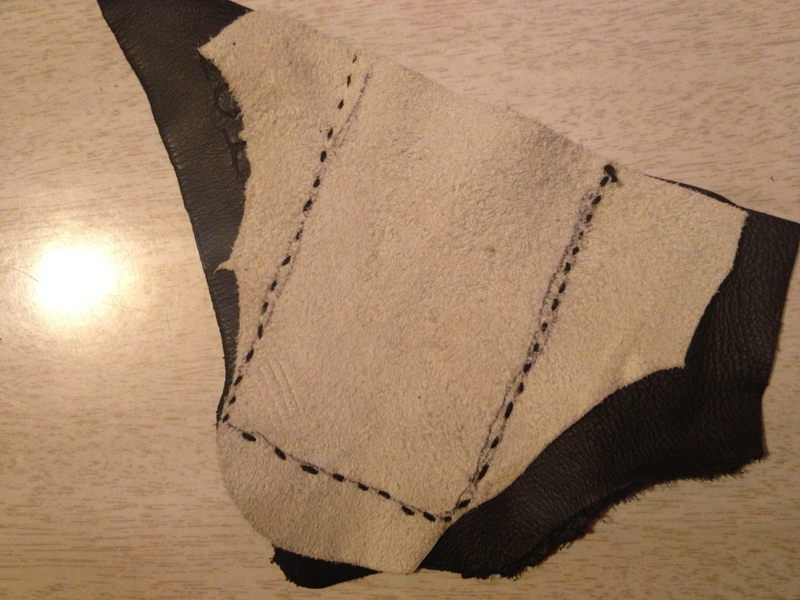 Once it was all stitched, I flipped the leather right side out and stretched into the corners. I tried my camera inside and it fit nice and snug, but was difficult to get in and out of. That is where the brown strip of leather comes in. I just made a few cross stitches at the bottom seam, top edge and stitched the ends together. This allowed for a small pull on each end of the case to help with putting the camera in and taking it out. 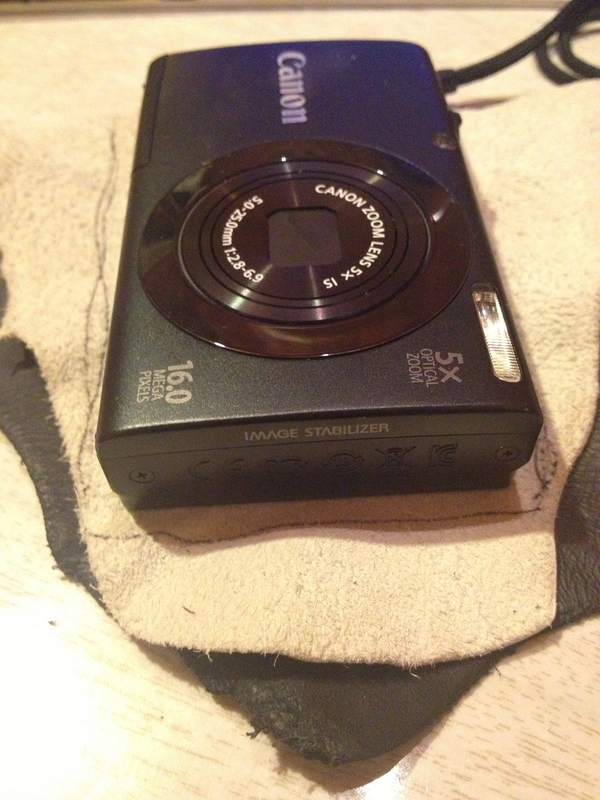 Here is an image of how the top strap just moves to the side while taking the camera out or putting it in. The strap also acts as a catch in case the camera tries to slide out on its own because I assume that over time the leather will naturally stretch a bit. This project took me a little over an hour to whip up and is a simple, customizable way to protect your electronics. 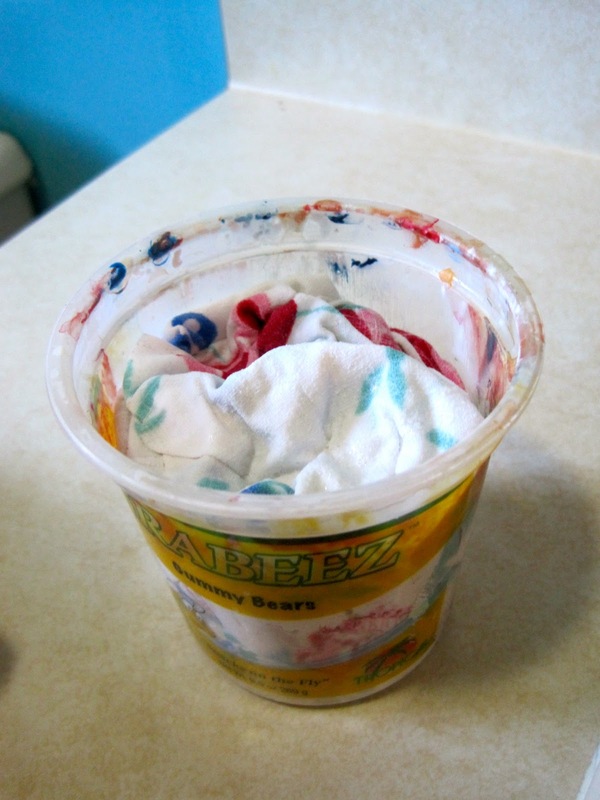 I am going to leave mine very plain but this project can be personalized in a million ways – different types of fabrics, paints, bleaching, size it down for a phone, size it up for a laptop! With the holidays coming up, being on a starving artist’s budget makes you get a little more creative with your gift giving. 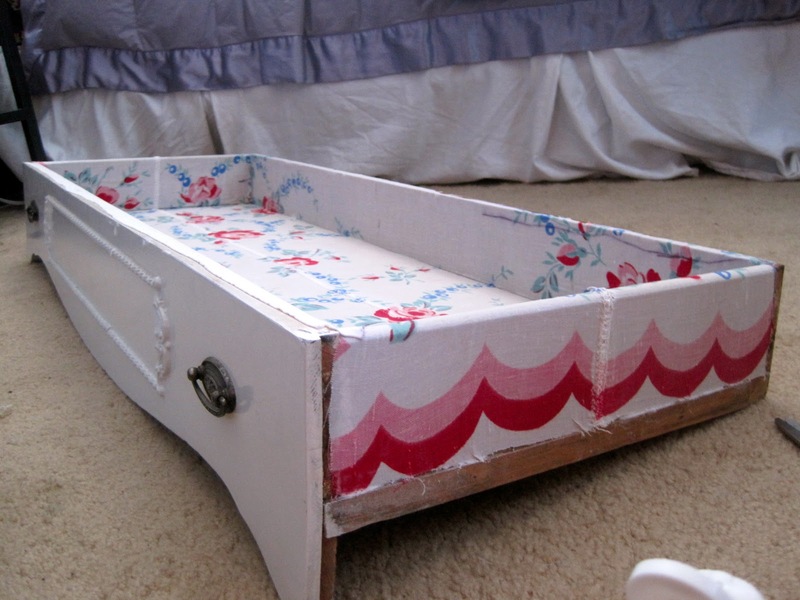 This is a great project that isn’t too expensive, and it’s easy to make. The only small warning is that it is pretty time consuming…it doesn’t look like it, but this one took me a combined total of about 8 hours to make. 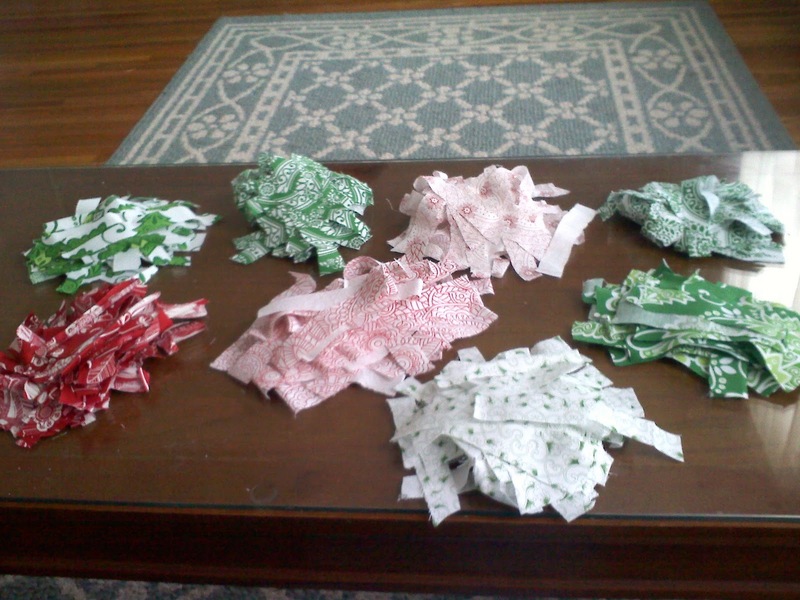 I raided JoAnn Fabric’s scrap section, and got as many different patterns of red and green I could find. The more patterns the better for this project I think. 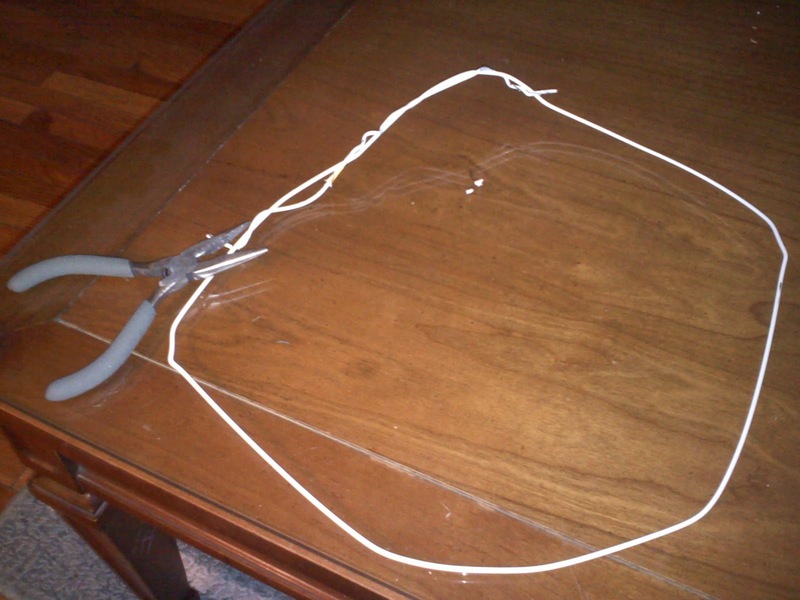 Take your wire hanger and bend it into a circle shape. It doesn’t have to be perfect, it kind of rounds itself out once all the fabric is on it, you’ll see. Now cut. And cut. And cut. This is what took the longest. 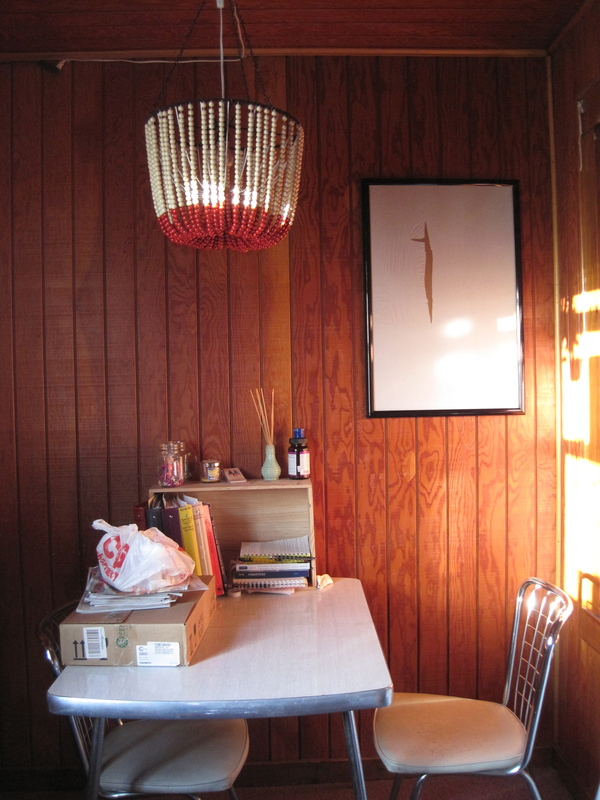 I cut my fabric into about 5″ x 1″ strips. I didn’t measure, just kind of eyeballed them. 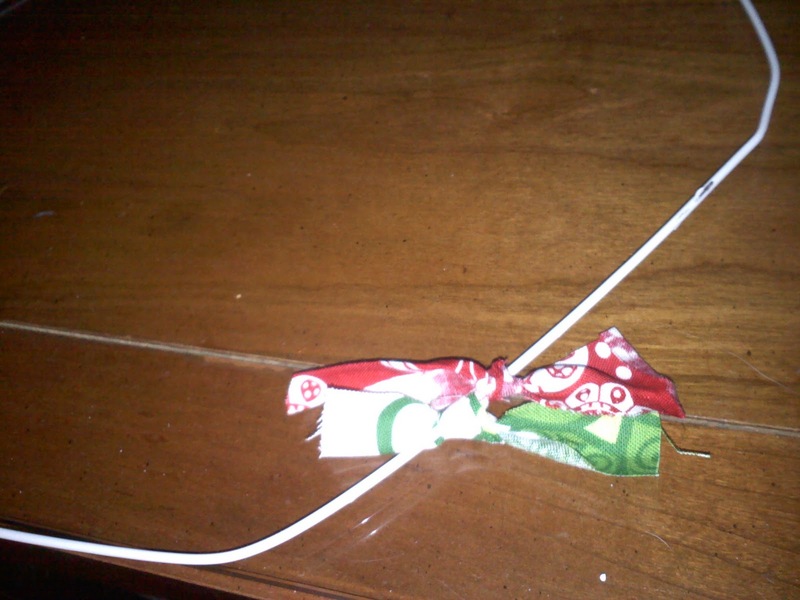 To attach to the wire, just tie each fabric strip in a single knot. 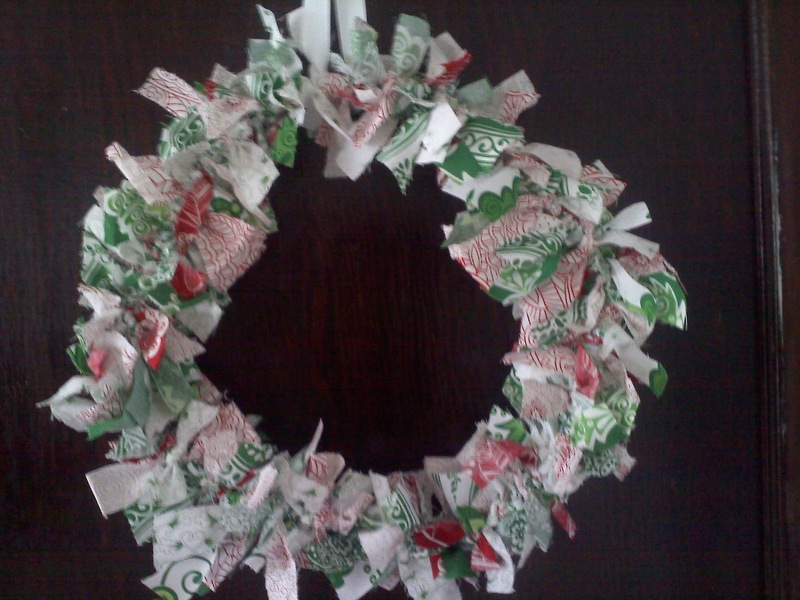 As you add more, push them together to fit as many strips on the wreath as possible, with no visible gaps to show the wire. Make sure you play with each strip as you go and get all the colored sides of the fabric facing the same way. 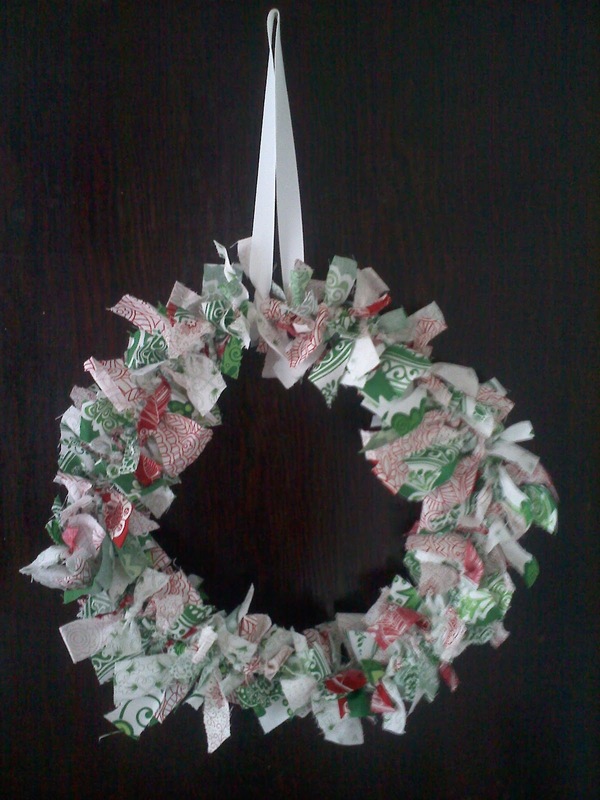 I went in a pattern, and kept it going through out the whole wreath. After the whole wreath was full, I tied a ribbon on to hang it from a door. 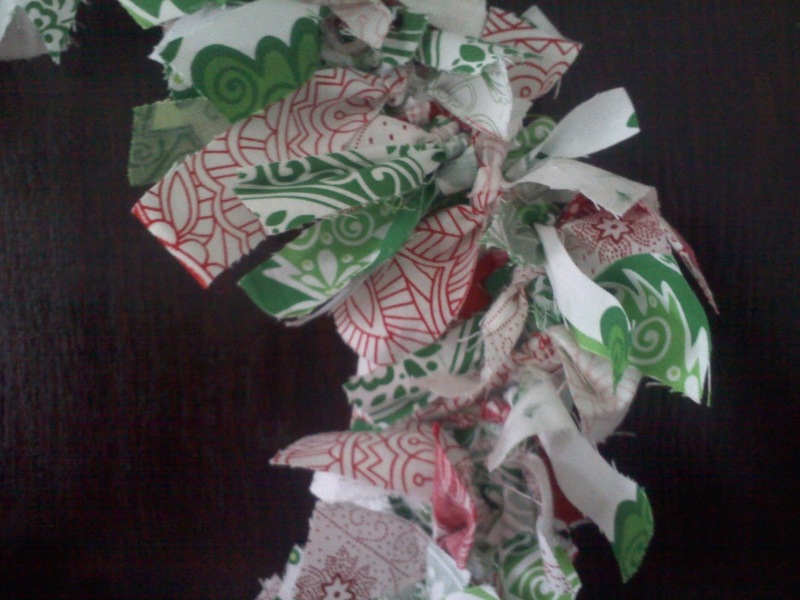 I actually had quite a bit of scraps left, probably enough to make another wreath. 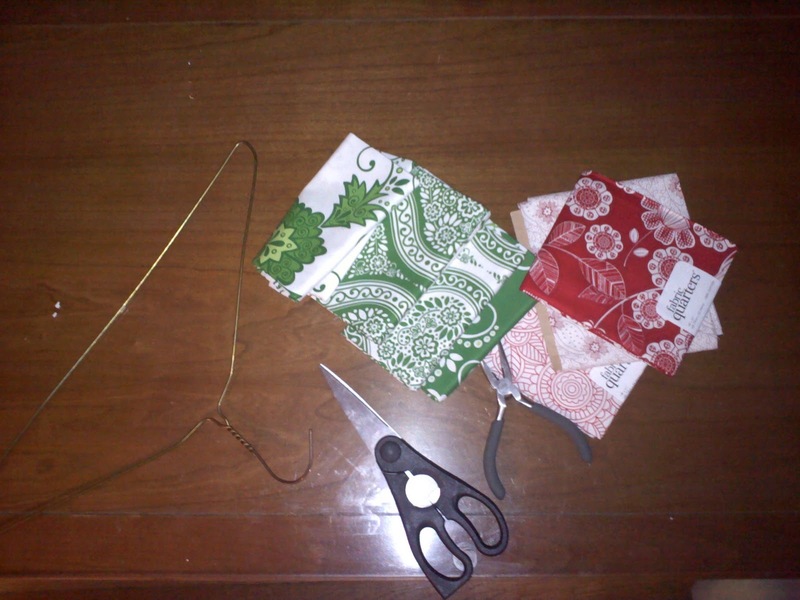 So if your looking for a cute, home-made, gift to give someone this holiday season, and have a free afternoon to cut some fabric…I say give this a try! I love the way it turned out! 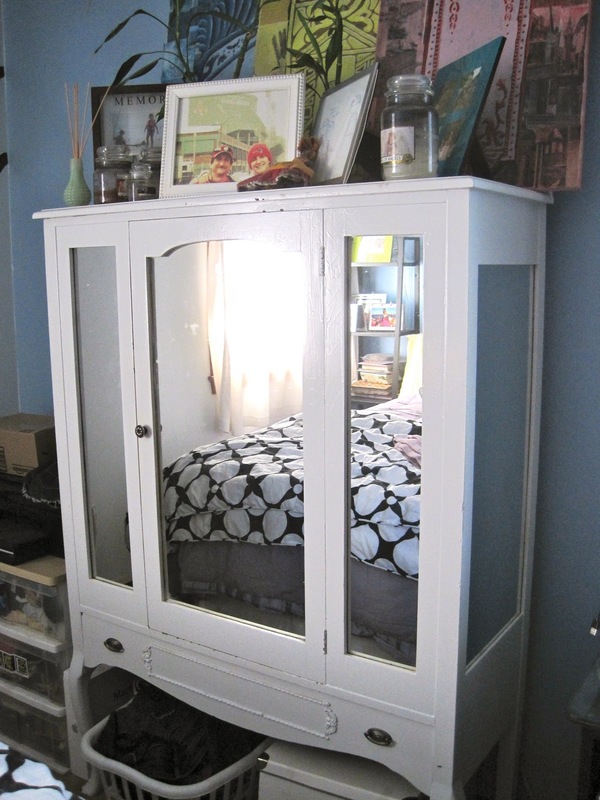 This armoire has taken on many forms and functions – from dark stained china cabinet, to its newest iteration as white lacquered clothes storage. I had given minimal thought to how to line the drawer – using old christmas wrapping paper as a placeholder until a better idea came along. 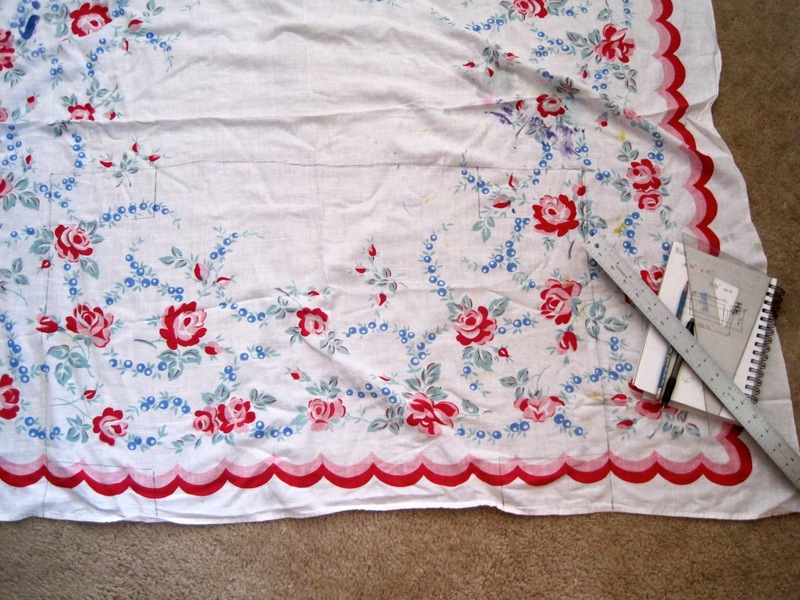 I finally found my inspiration in a flowery fabric table cloth that was out of commission due to paint stains and holes. 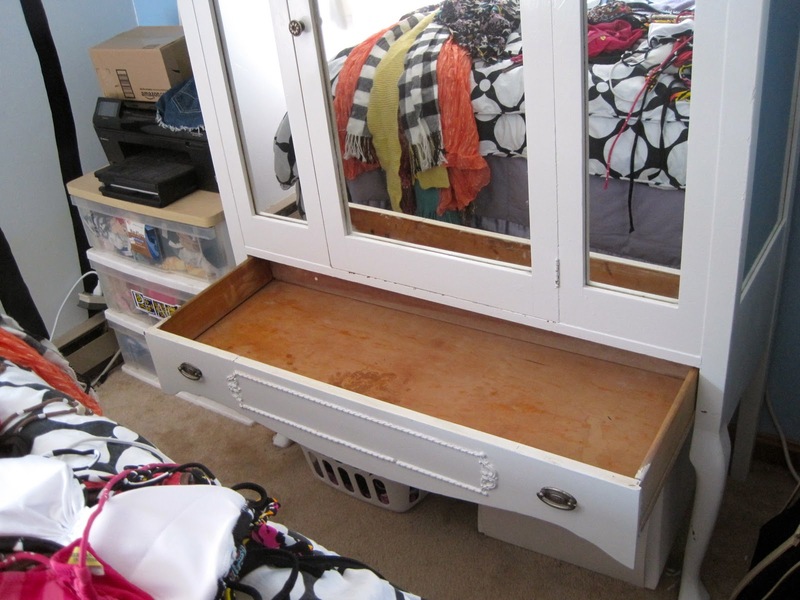 First I cleaned out the mess of scarves, bathing suits and belts that I use the drawer for. 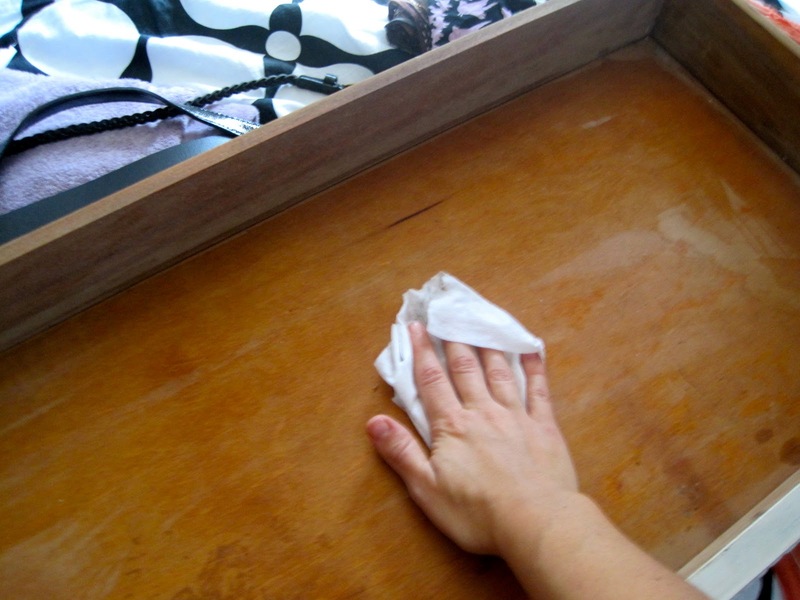 Next I wiped the drawer down to make sure that the fabric has a clean surface to cling to and doesn’t bubble up in any spots. 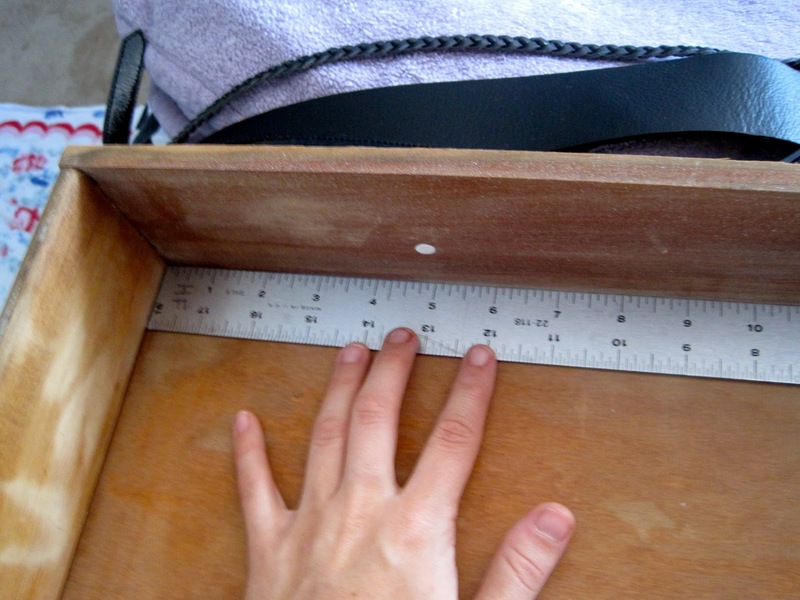 Next I measured the dimensions of the base and the sides. Then I drew the dimensions out on my fabric so that it comes out as one cohesive piece. 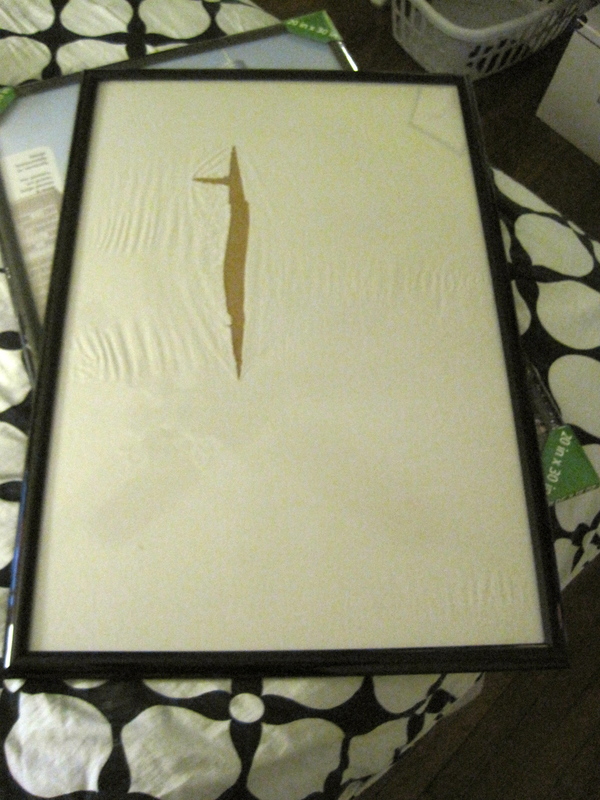 And as they say “measure twice, cut once,” which of course I forgot and ended up having to cut a second piece. 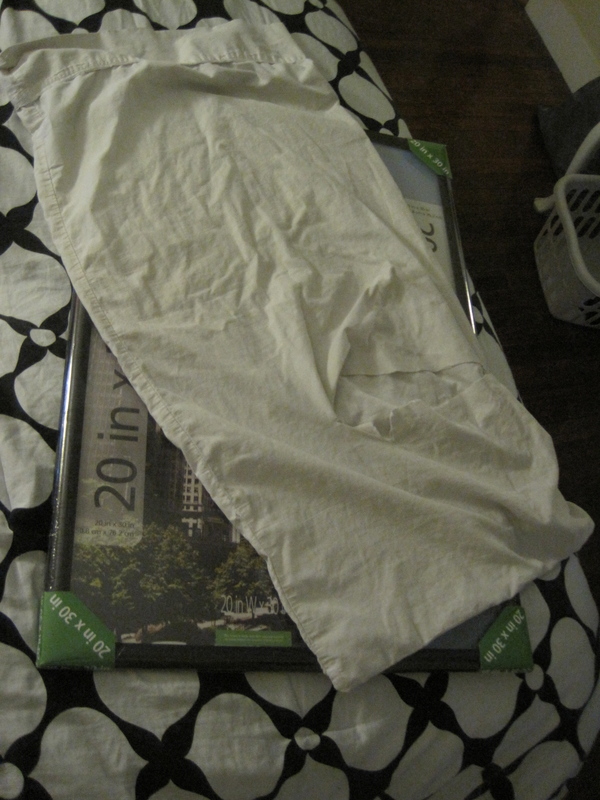 Luckily the tablecloth was big enough to accommodate my mistake. Also, if you want a uniform pattern, center your measurements on the fabric. 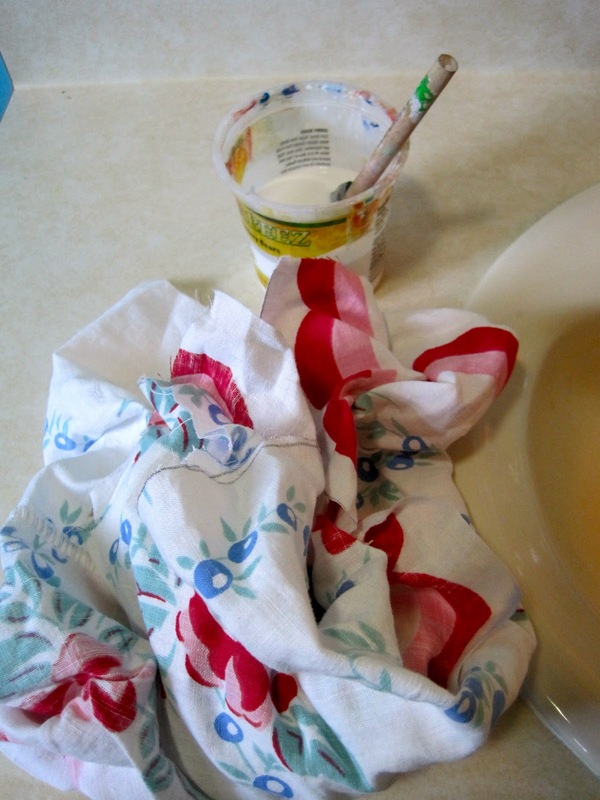 Now here is where the fun begins, I watered down Mod Podge (I’m sure any sort of white glue would work in this situation, just as long as it dries clear) and soaked the fabric until it was all saturated. Amazing that it all fit into that small container! 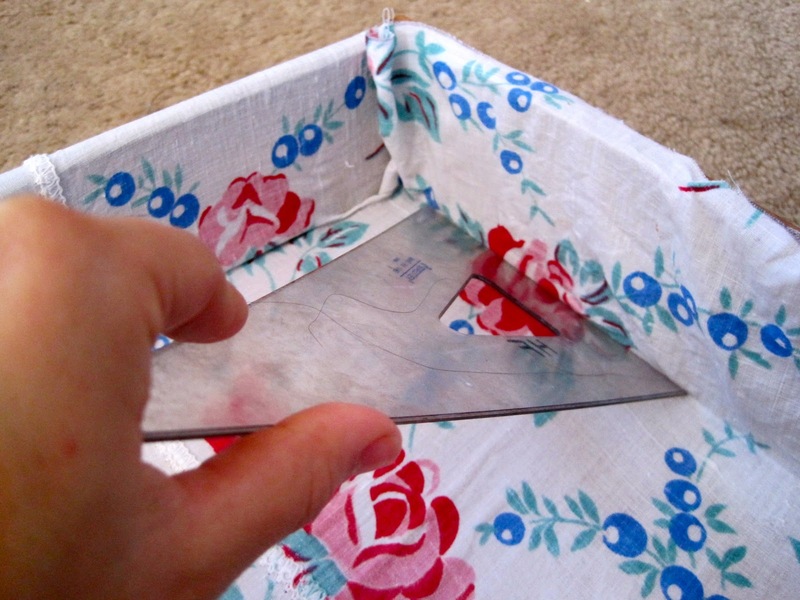 Next I laid the fabric over my drawer and used my trusty triangle to smooth the fabric into all of the corners. This part took the longest, just to make sure all of the air bubbles were smoothed out and the pattern was relatively even. 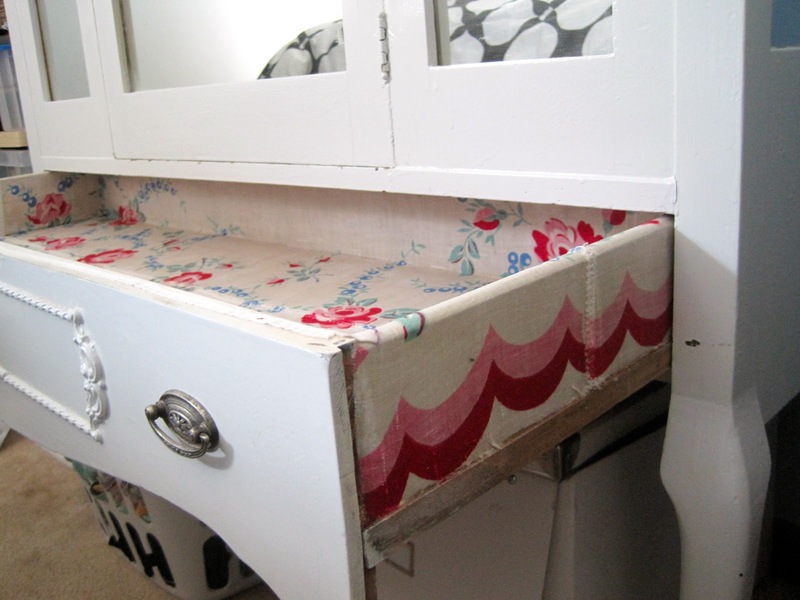 I let the fabric bleed over the edge so that it is seen on the sides when the drawer is pulled out, but I double checked to make sure the drawer could accommodate the extra fabric while still sliding in and out. Once the fabric was all down and where I wanted it, I slathered a thicker coat of Mod Podge all over to secure all of the edges. 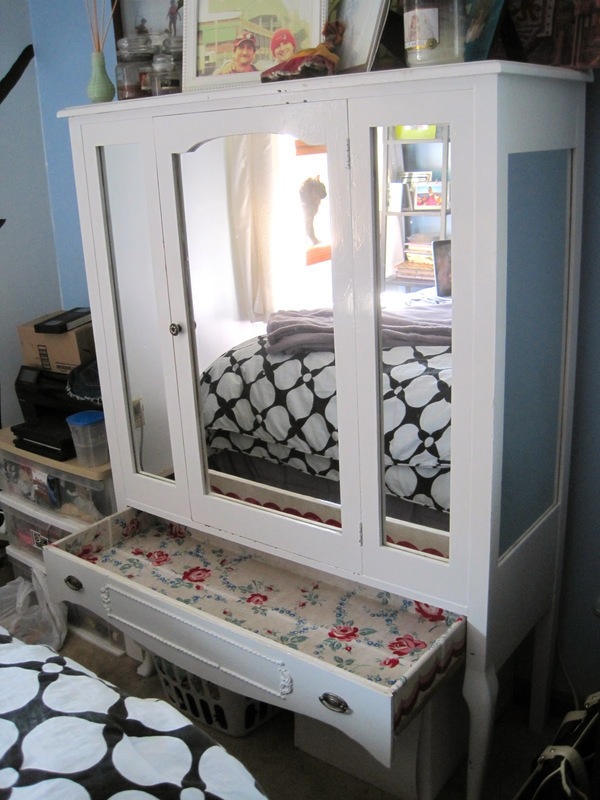 I then let it dry overnight and sprayed a light coat of clear gloss sealer to combat any tackiness left from the glue. Et voila! Installed and ready for filling. One thing to consider if you decide to take this project on – the wood shows through a bit under the white fabric, so if you want a bolder look go with a fabric with a colored base to it.